DUNEDIN, FL - The Dunedin Blue Jays scored nine runs on 18 hits Saturday night and have taken the first two games of the final weekend at Dunedin Stadium. All nine Blue Jay hitters recorded a hit and eight of the nine scored as Dunedin put up runs in six of their eight at-bats. Alfredo Rodriguez drove in the first run of the game with a fielder's choice ground-out in the top of the second. Nash Knight hit a two-out single in the bottom of the second off LHP Wennington Romero to tie the game at one. Logan Warmoth led off the third with a single, stole second, and scored on a Riley Adams one-out base hit to put the Blue Jays up 2-1. A Joshua Palacios two-run triple in the fourth extended the Dunedin lead to 4-1. Palacios came into score a few pitches later on a Logan Warmoth RBI double to run the lead to 5-1. Daytona loaded up the bases in the fifth and cut the deficit in half. First, Tyler Stephenson drew a five-pitch bases walk to force in the Tortugas second run. Their third run scored on a RHP Yennsy Diaz wild pitch. Dunedin got one of the runs back in the bottom of the sixth after Ivan Castillo hit a one-out RBI double. The Blue Jays went back up four in the seventh on a two-out RBI single from Warmoth. Dunedin rounded out the scoring in the bottom of the eighth. They went up 8-3 when Castillo scored on a wild pitch from RHP Ryan Hendrix, then a two-out RBI single from Yeltsin Gudino made it 9-3. RHP Jonathan Cheshire (6-1) earns the win in relief after working 2 ⅓ scoreless innings. He hit one and struck out three Tortugas. Romero (8-10) suffers the loss. He allowed five runs on nine hits in 3 ⅔ innings with three walks and a strikeout. The Tortugas will turn to RHP Tommy Bergjans (5-2, 3.68) in the regular season finale Sunday afternoon. Dunedin will counter with RHP Maverik Buffo (3-4, 6.36). First pitch Sunday is scheduled for 12 PM on AM 1230, AM 1490, and FM 106.9 WSBB. 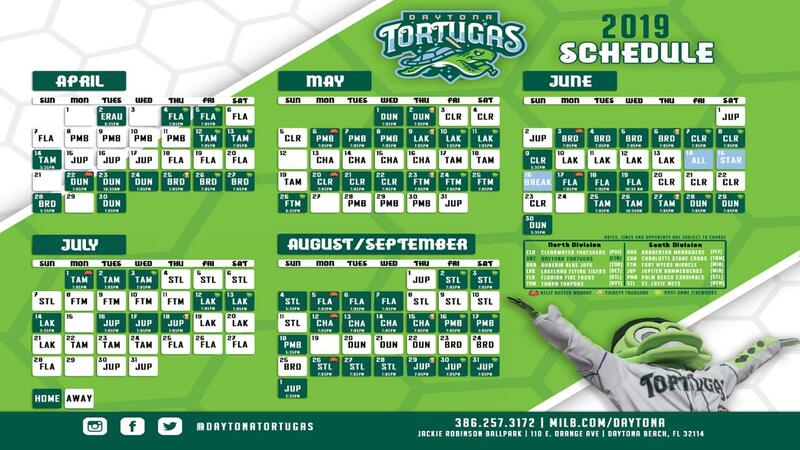 NOTES: The Tortugas fall to 0-43 when trailing after eight innings… 8 of the 17 Tortuga losses since August 1st have been by 5+ runs… The Tortugas have scored 3 runs or fewer in 17 of their last 30 games. They are 3-14 when scoring 3 or less in that span… Courtney Hawkins singled in the second to break out of an 0-for-21 drought… Alberti Chavez has a hit in all 4 games since returning from the DL… Stuart Fairchild finished with his 14th multi-hit game. He is 7-for-his-last-12… Brantley Bell stole his 21st base of the season… Bruce Yari recorded his 27th multi-hit game of the season.